Servicemen talk as they walk along where the new concrete runway for the Airport in the Sky will be built on January 26, 2019. The 3,000 foot runway is being rebuilt in partnership with the Catalina Island Conservancy, Marines and Navy. Photo by Valerie Osier. But he’s not on a military base or in enemy territory—he’s on Santa Catalina Island, on watch near the restaurant and gift shop at the Airport in the Sky. And while the airport isn’t under any immediate threat, it is under construction. 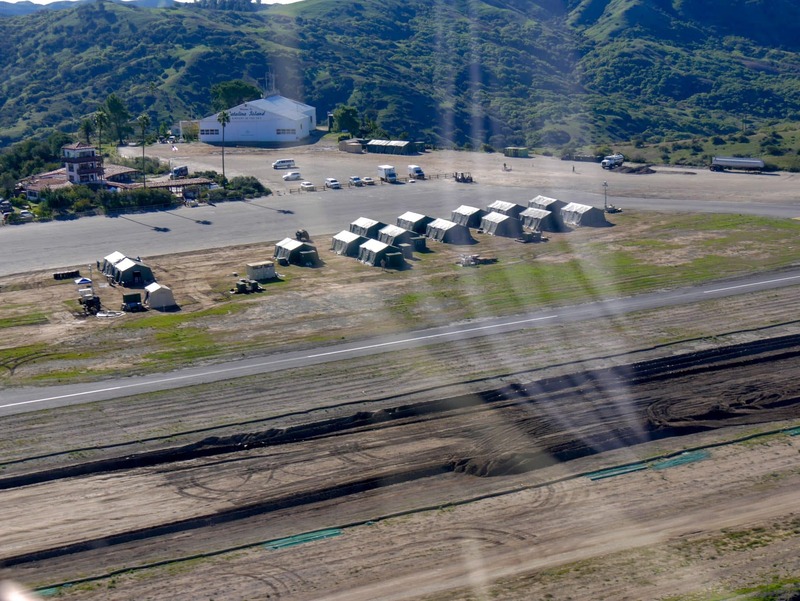 As part of a unique partnership between the Catalina Island Conservancy, the Navy and the Marines — around 100 service men and women — are rebuilding the badly needed airport runway in exchange for being able to use the experience as training for when they need to do construction in other parts of the world in order to complete missions. 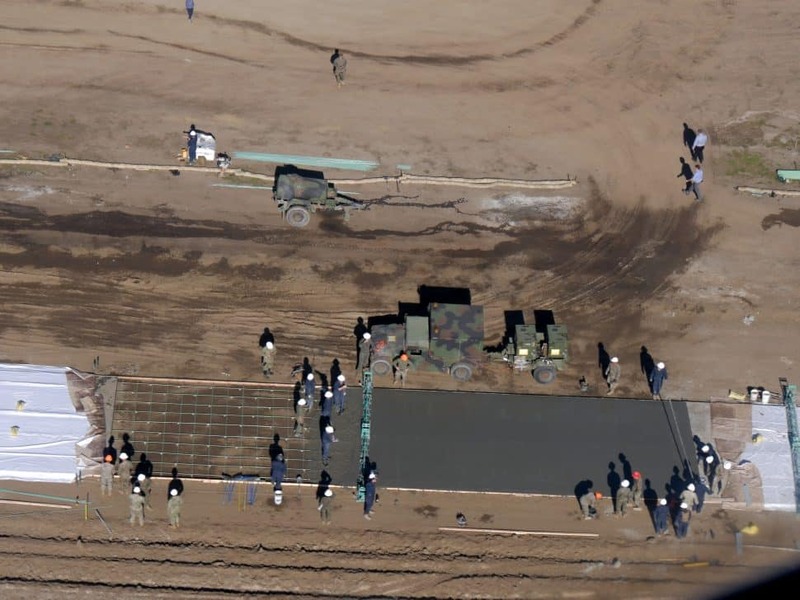 An aerial view of U.S. Marines and Navy Seabees working on constructing a 60-by-76 foot concrete pad that will eventually make up the Airport in the Sky’s new runway on January 25, 2019. The 3,000 foot runway is being rebuilt in partnership with the Catalina Island Conservancy, Marines and Navy. Photo by Valerie Osier. For years the Conservancy has been repairing the airport’s 3,000-foot asphalt runway at a cost of about $250,000 each year. The island’s only airport is notorious for its pothole-ridden runway situated at an elevation of 1,600 feet with a steep cliff on each end. Pilots unfamiliar with the airport have skidded off the runway and over the edge of a cliff after landing and failing to stop in time. The Caltrans Aeronautics Division told the Conservancy it needed a long-term repair plan in place by September 2018 or it wouldn’t be able to keep operating the runway. 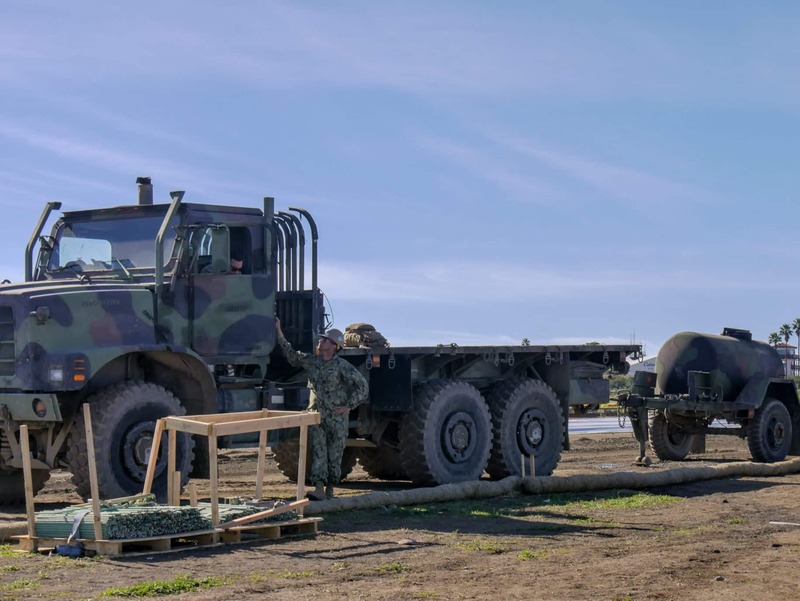 A visiting Navy Seabee told the Conservancy about the Department of Defense’s Innovative Readiness Program that matches community needs with military training. “We realized that the current military hadn’t built an airport in a long time,” said Tony Budrovich, the Conservancy president. 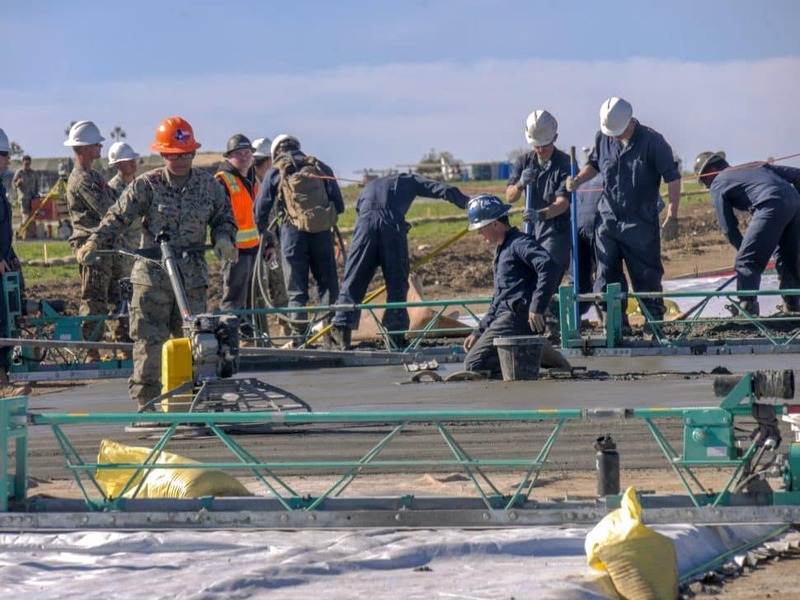 U.S. Marines and Navy Seabees work on constructing a 60-by-76-foot concrete pad that will eventually make up the Airport in the Sky’s new runway. 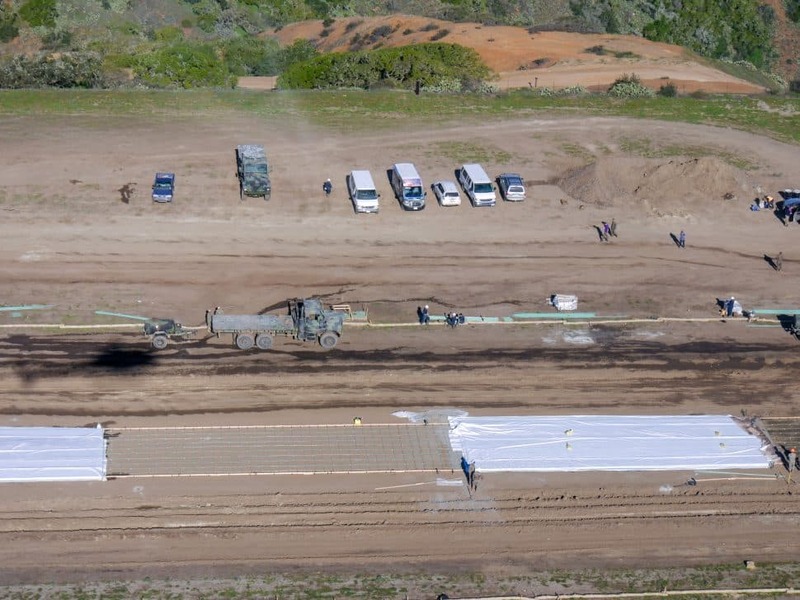 The 3,000-foot runway is being rebuilt in partnership with the Catalina Island Conservancy, Marines and Navy. Photo by Valerie Osier. The Defense Department granted the project after about 18 months of working with the Conservancy to develop it, and saved the Conservancy an estimated $1 million by not having to pay for labor and equipment. 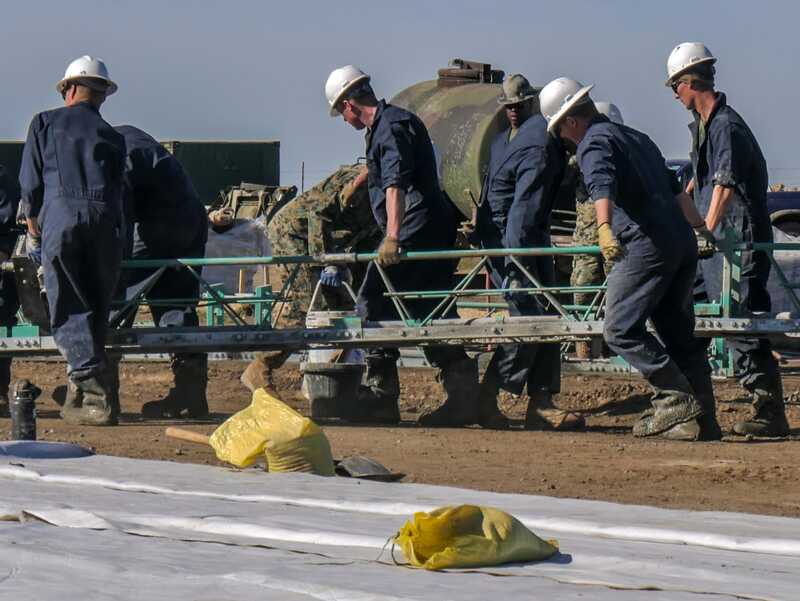 The 1 Marine Expeditionary Force at Camp Pendleton assigned 3rd Marine Aircraft Wing from Miramar to lead the work, with the help of the Navy construction group, aka the Seabees. The entire project is valued at $5 million. The Conservancy launched a fundraising campaign in October. With proceeds from that campaign, the military’s help, plus a recent $1.5 million donation from ACE Clearwater Enterprises, an aerospace manufacturing company in Torrance, the Conservancy is on its way to raising the remaining funds for the project, Budrovich said. The military’s equipment and supplies started landing on Catalina in late December and the troops landed in early January. To make the project an effective training exercise, everything has to be like it would in any other remote location—hence, the armed guards. One of the first things the troops set up was the standard layout of a self-sustaining base camp, with a food and water supply and power grids. 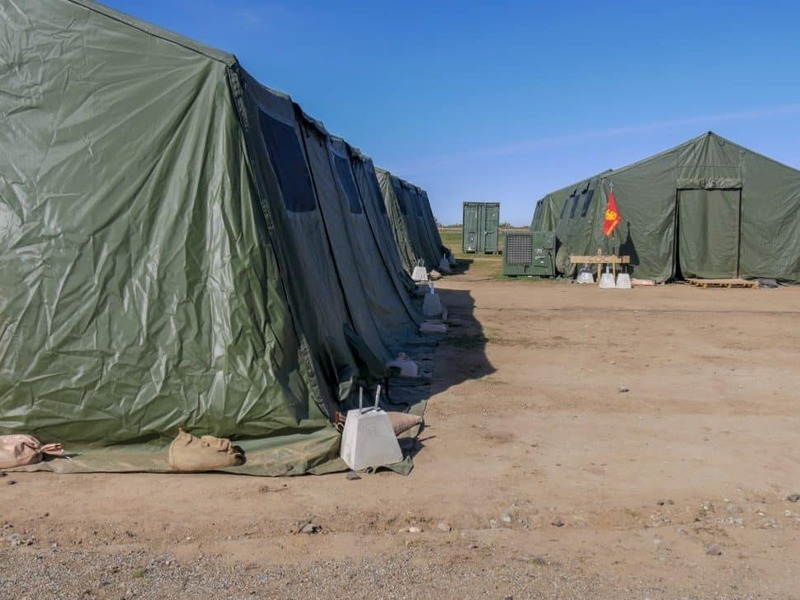 The living quarters of the U.S. Marines and Navy Seabees who are working on reconstructing the Airport in the Sky’s runway on January 25, 2019. The 3,000 foot runway is being rebuilt in partnership with the Catalina Island Conservancy, Marines and Navy. Photo by Valerie Osier. Breakfast and dinner are usually bulk versions of MRE’s (Meals Ready to Eat) and lunches are usually the individual MRE’s down by the construction site. Even the equipment is pared down to only the essentials—they don’t necessarily have everything a private construction site would. The cement gets mixed downhill from the airport and hauled up a windy dirt road every day. “We’re simulating for a deployment,” Marine Sgt. David Bickel said. But it’s still very different from most of their assignments—they’re on an island in Southern California. 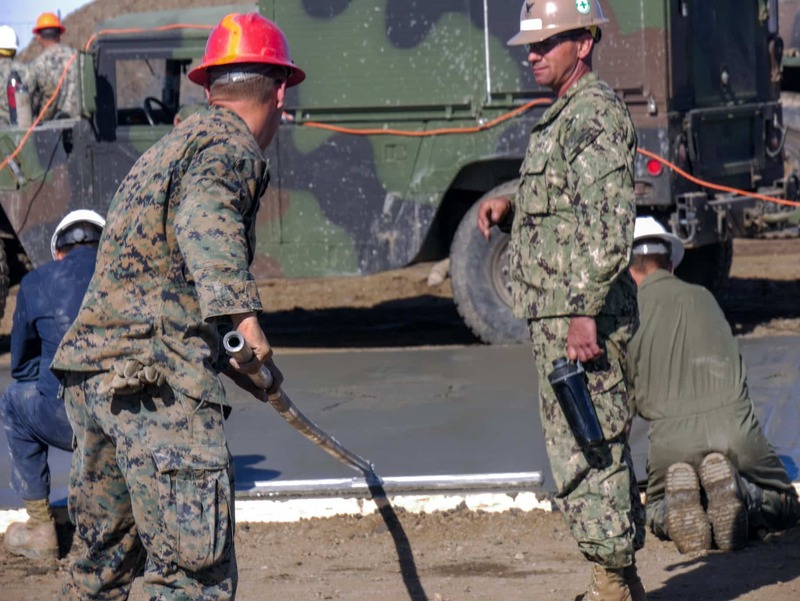 For Lopez’s unit of Seabees, this is what they do: build and fix stuff around the world. 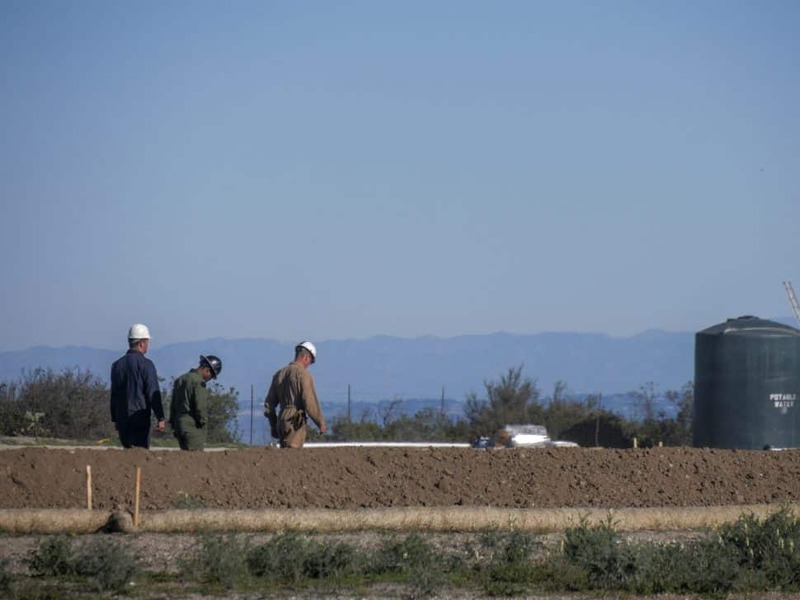 But for the Marines, this is their first full-scale runway project built from scratch. 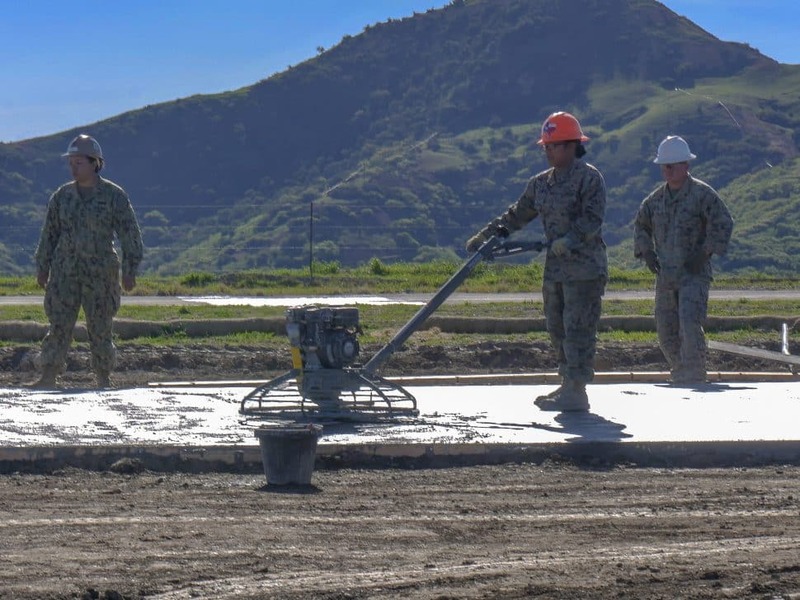 U.S. Marines and Navy Seabees work on constructing a 60-by-76 foot concrete pad that will eventually make up the Airport in the Sky’s new runway. The 3,000 foot runway is being rebuilt in partnership with the Catalina Island Conservancy, Marines and Navy. Photo by Valerie Osier. 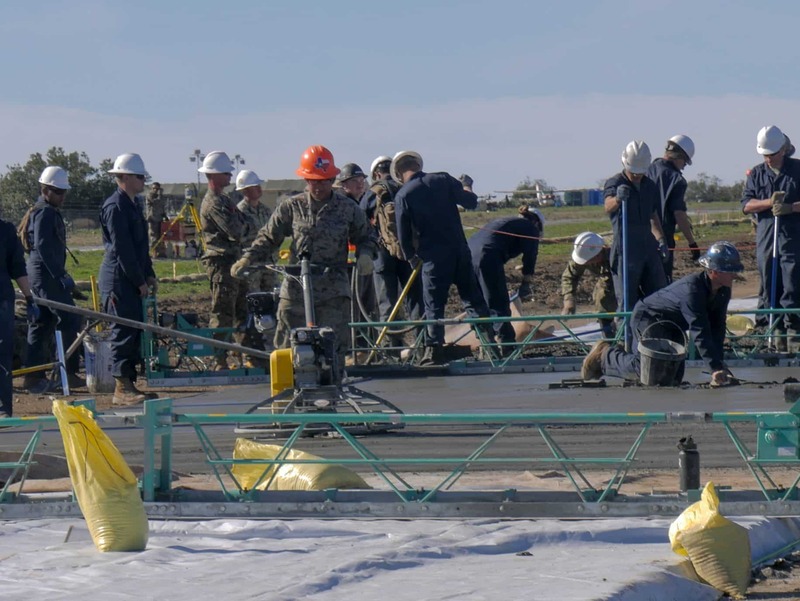 The Seabees and Marines will work together to build more than 100 60-by-76 foot concrete pads to stretch 3,000 feet as the new runway. They expect the runway to be finished by late March, as long as the weather stays fair. The recent rains set the work back a bit, but the crew was able to continue getting some of the preparation work done inside a nearby aircraft hangar. For now, aircraft have to have special permission to fly into the Airport in the Sky, but the Catalina Flying Boats are still bringing in mail and deliveries from the mainland. The aircraft that do land are using the airport’s old taxiway to take off and land. Editor’s note: This story has been updated to add more context on previous crashes at the airport. It was also updated to clarify how much funding the Conservancy needs for the project. 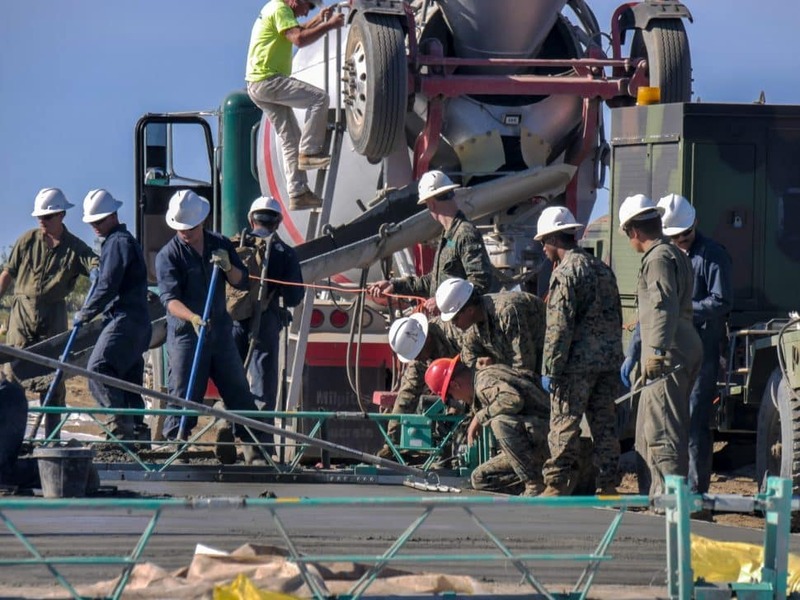 U.S. Marines and Navy Seabees work on constructing a 60-by-76 foot concrete pad that will eventually make up the Airport in the Sky’s new runway on January 25, 2019. The 3,000 foot runway is being rebuilt in partnership with the Catalina Island Conservancy, Marines and Navy. Photo by Valerie Osier. An aerial view of several 60-by-76 foot concrete pads that will eventually make up the Airport in the Sky’s new runway on January 25, 2019. The 3,000 foot runway is being rebuilt in partnership with the Catalina Island Conservancy, Marines and Navy. Photo by Valerie Osier. 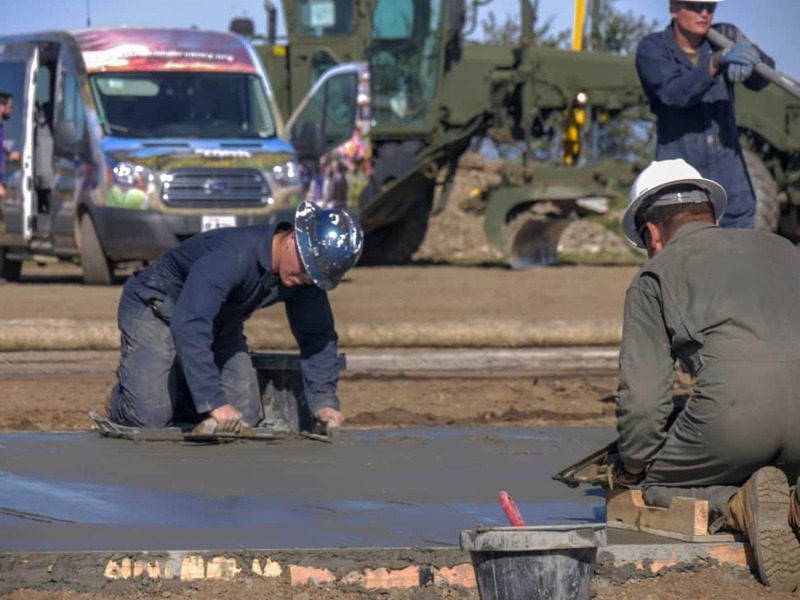 Two servicemen talk as they work on the new concrete runway for the Airport in the Sky on January 26, 2019. The 3,000 foot runway is being rebuilt in partnership with the Catalina Island Conservancy, Marines and Navy. Photo by Valerie Osier. An aerial view through a helicopter window of the living quarters of the U.S. Marines and Navy Seabees who are working on reconstructing the Airport in the Sky’s runway on January 25, 2019. The 3,000 foot runway is being rebuilt in partnership with the Catalina Island Conservancy, Marines and Navy. Photo by Valerie Osier.